While backing up image files yesterday, I came across an image of a Purple Gallinule that I photographed in Everglades National Park. 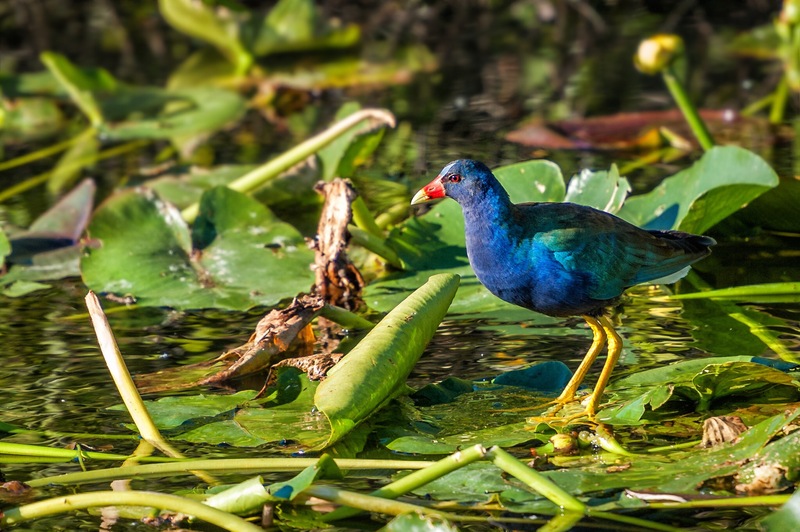 It was a rewarding discovery, because it brought back memories of that visit to the Everglades and the pleasure of watching the Purple Gallinule scooting across lily pads in search of food. I was in the Everglades very early, when I found the Purple Gallinule, and the morning sun was brightly illuminating its colorful iridescent feathers. Gallinules live in swamps and wetlands in southeast United States. They eat a wide variety of food including frogs, grasshoppers, dragonflies, spiders and water plants. The Purple Gallinule is not a very good flyer, but it is an excellent wader. It uses its long toes to distribute its weight, when walking on lily pads. If you live in or near Prince William County, Virginia, or care about the environment, there is a pending solid waster permit decision in March by the Department of Environmental Quality (DEQ) that may allow Dominion Power to bury 4 million tons of coal ash at Possum Point in an impoundment that is leaching highly toxic contaminates into the groundwater. It is has been and is poisoning people today! There are other solutions, as explained in the above film. I hiked Paynes Prairie Preserve State Park‘s La Chua Trail with family and friends last night, and it was spectacular! Not only was the sunset breathtaking, but it was highlighted by groups of Sandhill Cranes and flocks of Ibis, flying onto the Prairie to roost for the evening. Included in this blog post are a few of the images I captured. In addition to the sunset, and there were 39 Bison grazing near the observation tower. I have seen Bison on the Prairie before, but maybe only a dozen at a time. It was truly a special evening. I have not reviewed and processed the Bison images yet, but below is an iPhone video that I took as I was leaving the observation tower. If you have your sounds turned on, you can hear the Sandhill Cranes. In conclusion, below is another iPhone video of the sunset on La Chua Trail. If you have never been to Paynes Prairie Preserve State Park, you need to go. You will not be disappointed. Possum Point on the Potomac River is contaminating the nearby river and creek and believed to be poisoning the ground water as well. Even if you do not live in Prince William County, you should read our coal ash article and watch the film, because coal ash contamination is a threat in 47 states in our country. The direct link to this article is: www.cpwtoday.com/coal_ash.html. This issue also provides uplifting articles and films on a local Farm-to-Table event, the hummingbirds that call Prince William County home for part of the year, and Prince William County hiking and biking trails. Our previous issues of CPWToday.com are also available, if you have not seen them. If you enjoy reading and seeing our articles and films, please share them with others. And, if you have any comments, please send them to us either online or by email. Protected Places Media (i.e., Ernie Sears and me) just released this short documentary video produced for the Prince William Environmental Excellence Foundation. The foundation held a Farm to Table Dinner to honor county farming and raise funds for their environmental education programs for youths and adults. Protected Places Media will be releasing the fourth issue of CPWToday.com by the end of the month of October. Featured articles include Climate Change and Coal Ash Toxin Pollution. We (Protected Places Media) just finished a short video in support of the Potomac Riverkeeper, Dean Naujoks. In the video, shot on the Potomac River near Dominion Virginia Power’s power plant on Possum Point, Dean discusses a protest to be held on October 4, 2016, at Gov. McAuliffe’s office in Richmond. If you live in the area and care about the health of the Quantico Creek, Potomac River and Virginia citizens, please watch the video and join Dean on October 4 in Richmond.